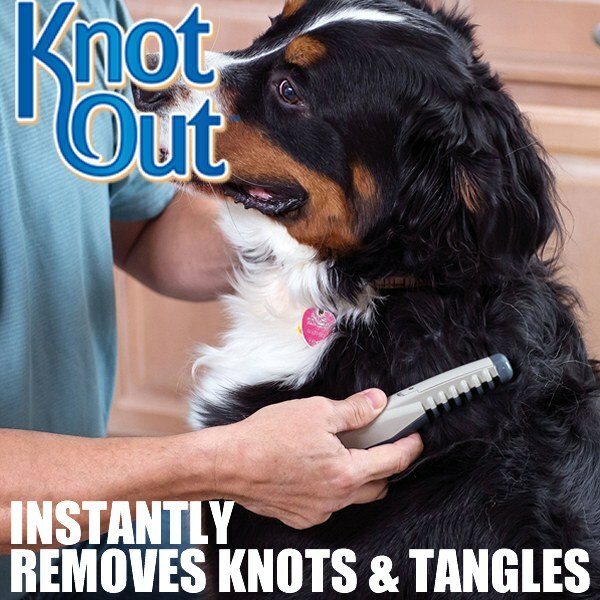 Knot Out is the ultimate pet grooming tool that safely combs and cuts tangles and knots. Your pet requires regular grooming but it&apos;s so much work! Traditional combs and grooming tools can pull and hurt your pet and groomers are so expensive! But now, there is Knot Out, the at home pet grooming tool that removes knots with the press of a button. The secret is in the small recessed blades that instantly eliminate knots for faster, easier grooming! Knot Out as seen on TV is also super safe, even if your pet moves while you are grooming, the safety teeth prevent the blades from coming into contact with skin! Now you can maintain a well groomed appearance without all the pulling, tugging and struggling! Great for all dog and Cat breeds. Buy Knot Out today! Didn&apos;t work the best on the knots in my dogs hair. Does not cut out knots! Doe not work at all! Very disappointed had high hopes for this product :( would not recommend waste of hard earned money. Wow I can&apos;t believe how good it works wish I got it sooner, my long haired cat just sits still while I combe her.